The pilgrimage church of Maria Rast in Hainzenberg above Zell am Ziller is a popular pilgrimage site. 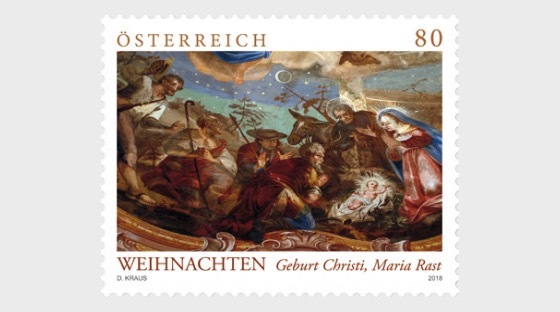 The Christmas stamp shows a section from the church's ceiling fresco. The church is located close to the Gerlos Pass road which links Oberpinzgau in Salzburg to Zillertal in the Tyrol. Zell am Ziller still belongs to the archdiocese of Salzburg, which is why this connection via the Gerlos Pass has long been considered important and was also an important transport route in the period when gold was still being mined at Hainzenberg, which continued into the 19th century. It is believed that there was already a small chapel at Hainzenberg in around 1300. A wooden chapeldedicated to Mary was built in 1659, which, so the tale goes, was also referred to as the “miners’ chapel” since the mineworkers used to pray there. The chapel was ultimately replaced by today’spilgrimage church in 1738. The church houses an elaborate Rococo altar containing the “icon of our lady of Maria Rast”, acarved wooden statue of the Madonna with the Christ child. The ceiling fresco was painted by Josef Michael Schmutzer and was completed in 1741. The artist was descended from the Schmutzer artistic dynasty, which had its roots in the Upper Bavarian municipality of Wessobrunn and the 17th century, although he primarily worked in the Ziller Valley and for Georgenberg Abbey. The ceiling fresco depicts events in the life of Mary, including the motif depicted on the stamp: the birth of Christ and the adoration of the shepherds. There is a particular connection between the famous Christmas carol and the Ziller Valley: the organ maker from the Ziller Valley Carl Mauracher learnt the new carol “Silent Night” while travelling toOberndorf and Arnsdorf and brought it back to his home region on his return. Two families of singers, the Strassers from Fügen and the Rainers from Laimach (not far from the pilgrimage church of Maria Rast), then spread it throughout Europe and abroad during the course of their travels. There is evidence of it being performed by the Rainer family on Christmas Day 1839 in New York. It was long believed that the carol originated from the Ziller Valley, until Franz Xaver Gruber proved its provenance with his “Authentic Origins of the Composition” in 1854.